YS Vivekananda Reddy breathed his last in the wee hours of Friday. He is known for his simplicity, humanity, commitment to serve the public and also remained in touch with the common man. Yesterday, YV Viveka had actively participated in the campaigning for YCP. He toured Chapadu Mandal extensively along with the local leaders. YCP Leaders are unable to accept the fact that YSR's Brother is no alive. 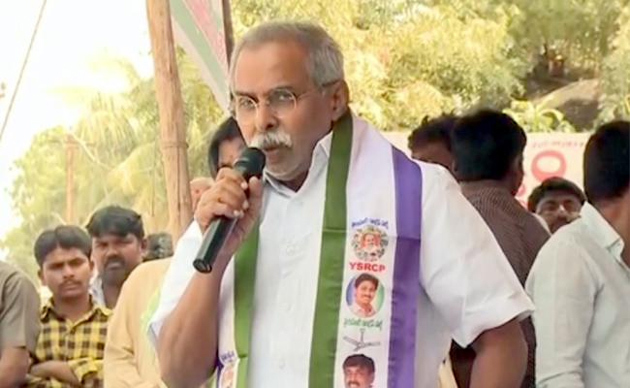 Kadapa Mayor Suresh recalled accompanying YS Viveka when he campaigned in Pulivendula Yesterday. Rajya Sabha MP Vijay Sai Reddy: 'YS Vivekananda Reddy has been in the public life for the past 35 years. He served as MLC, MLA, Minister and MP with utmost sincerity. It's an irreparable loss'. Ummareddy Venkateswarlu: 'YV Viveka holds the record of raising highest number of questions in Parliament during the 5 years term. He is such a Politician. It's a big loss not just for YSR Family but also for YSR Congress Family'. Rayachoti MLA Srikanth Reddy: 'Both My Father and YS Viveka were Samithi Presidents in 1981. He was instrumental in helping me obtain MLA ticket in 2009. Jagan admires his Babai so much. Hope, God gives the family member enough strength to overcome this phase'.